Of all the homes built in Market Common, the most unique, yet recognizable, are the neighborhoods developed by Dock Street. From the original live-work townhomes to the rainbow colored Sweetgrass homes, Dock Street's creations stand apart from the other more traditional subdivisions. One of the newest Dock Street communities is The Battery. 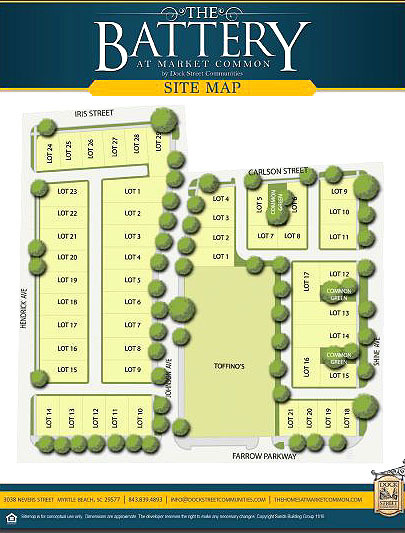 The Battery incorporates peaceful streets with lots of greenery, and close proximity to the retail district. You will be able to walk to the many restaurants, stores, and theater, as well as Market Common's membership swimming pool, parks, trails, and outdoor festivals. This group of 50 single-family low country-style homes features their 1686 sq ft Berkley design; a split-level 3 bedroom, 2.5 bath home with a covered front porch, 2-car garage, front yard, and courtyard. Inside you'll find luxury appointments like granite countertops, 10-inch ceilings, hardwood floors, slate appliances, and designer cabinetry. Homeowners will also have the opportunity to personalize with a wide range of options and upgrades. The Florence floorplan offers a 3 bedroom 2 bath plan, with an optional bonus room and loft, at 1802 sq ft. Choose the exterior colors of your home when you purchase before it's built. Prices will start in the $300,000's. The Battery is still in the pre-selling stage. Call us for more information and to work with you to find the best price and options that you want in a perfect home in Market Common Myrtle Beach.